Years ago, I remember having a conversation with a friend of mine about Spencer W. Kimball’s inclusion of a goofy story about Cain in his book “The Miracle of Forgiveness,” which is (thankfully) out of print. It’s not worth revisiting at length, but then-Elder Kimball quoted from the journal of early church leader David W. Patten, who claimed to have met Cain while riding on horseback. Cain was allegedly about seven feet tall and completely covered in hair, and he lamented that he was cursed to roam the earth until the Second Coming. This story is the genesis of the Mormon folklore that Cain is actually Bigfoot. I didn’t say anything in response, but I should have. Because the reason we don’t have to believe this has nothing to do with whether Spencer W. Kimball was the prophet or not when he wrote it. The reason we don’t have to believe this is because it isn’t true. I think too many Latter-day Saints have a distorted sense of what the Lord expects from us with regard to how we accept and understand truth. At no point are we ever required to believe anything that isn’t true. That includes things that aren’t true that may be believed by people in positions of ecclesiastical authority. I thought about this as I read this thoughtful piece on the subject of whether or not Mormons believe we each get our own planet when we die. This writer addresses this bit of folklore at length and does yeoman’s work at trying to explain it, but I think the piece falls down when it tries to justify the reasons why Mormons don’t necessarily believe it. Mormons believe that all scripture is given by revelation by the Holy Spirit… However, not all scripture is equally valuable… We believe God has called prophets and apostles to receive revelation for the whole Church… However, even among these men, there is a prescribed order in the Church for receiving revelation. The writer admits that all this “may seem a bit confusing to a non-Mormon.” I submit that they’re a bit confusing to this lifelong Mormon, too. Apparently, if a prophet says something, but his counselors don’t say it, it’s not doctrine, but if his counselors do say it and the Twelve don’t, it is doctrine, although it must be measured against the four Standard Works of scripture, which are not infallible and can be superseded by the very statements that are being measured against them, although those statements can be later “clarified or extended,” but not in books or writings that don’t have universal endorsement or official lesson manuals that are old, although the Joseph Smith Translation can provide an inspired-but-non-doctrinal commentary. Also note that the Proclamation on the Family is, maybe, 94% doctrine, Mother-in-Heaven is approximately 87% doctrine, and the idea that God was once a man is on a sliding scale of 73% to 22% doctrine, depending on how it’s extrapolated. With everything else, you have to exercise judgment. The answer to the first part of that question is “no, you can’t,” and the answer to the second part is “yes, you do.” You always have to exercise judgment if you want to know the truth. Moroni 10:5 states that “by the power of the Holy Ghost, ye may know the truth of all things.” Indeed, throughout the scriptures, the Lord makes it clear that the Holy Ghost is the only way to know truth. In Doctrine and Covenants Section 50, versus 19 and 20, the Lord asks, “he that receiveth the word of truth, doth he receive it by the Spirit of truth or some other way? If it be some other way it is not of God.” That includes discussions where people are browbeaten into accepting something as “doctrine” because it fits some arbitrary list of criteria, no matter how well-reasoned that list may be. So whether or not the Cain-as-Sasquatch story fits any or all of that criteria is not at all relevant. 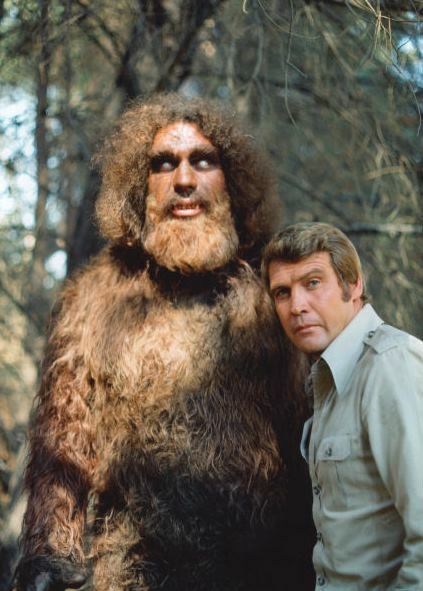 Whether the Holy Ghost will testify to the truthfulness of the Cain-as-Bigfoot story is the only thing that matters. In my admittedly fallible experience, I have received no such confirmation and therefore feel entirely justified in rejecting such nonsense freely. And yes, you still have to exercise judgment about issues that clearly check all the right doctrinal boxes. The fact that Jesus Christ the Savior of the World is at the heart of all Mormon doctrine, but the Lord requires each member to receive an understanding and testimony of that truth from the Holy Ghost. It is not enough to know that the all prophets have said it or it appears in every lesson manual, even the new ones. You are not absolved from exercising judgment about this bit of doctrine simply because its official status is beyond dispute. And if the answer is yes, than it doesn’t matter whether the truth appeared in the fully authoritative-but-fallible Standard Works, an almost-fully authoritative Proclamation on the Family, a quasi-authoritative Deseret Book publication written by an emeritus Seventy, or a completely non-authoritative Six Million Dollar Man episode. For truth is truth. To the end of reckoning. Shakespeare said that, but I’m not sure if his counselors agreed, so you don’t necessarily have to believe it. I was a theatre major at USC, and, as such, it was my duty to dig up a string of monologues for class assignments, and, invariably, the same monologues kept being recycled, and I can only take so much Christopher Durang. So I started writing my own and, to be sure that I was being judged on my acting and not my writing, I attributed them to a fictional author, the good Mr. Cornell. That actually makes sense if we’re playing it old school. If you’re doing a classical piece, then there are only 37 Shakespeare plays to choose from, and everyone’s heard all the good stuff in them before. But the Troubled Young Actor Community is stuck on all the same tired modern pieces, and you hear the same ones over and over. You get very sick of them very quickly. Now I recognize that for auditions, I could have just written my own monologue, but the minute you did, you were being judged not just as an actor, but as a writer. And the actors who did that always looked like pretentious buffoons. Auditioning is nerve-wracking enough without having to have another layer of judgment slathered on top of the first one. So I used my pseudonym Stallion Cornell to become a monologist. “It’s by Stallion Cornell,” I said, assuming that he, like anyone who was anyone, would have heard of him. Which is an easy assumption to make, because everyone in the theatre likes to appear well-read and contemporary and comments on books and plays that they’re supposed to know. I laughed scornfully. Scorn is always good, too. It was hard to keep my secret from my classmates, but the adults, if they ever caught on, never said anything. And it didn’t hurt that Stallion’s pieces were now being used at several auditions, on campus and off. My fellow actors, it seems, were just as bored with the old stuff as I was, and they used the Stallion pieces to cut through the noise. So it became a simple thing to toss off a ridiculous monologue here and there, and everyone felt like they were getting away with something. One of the proudest moments of my life was hearing that one of the actresses in my class used a Stallion Cornell monologue to land a recurring role on a soap opera back in New York. And back in Los Angeles, the last week of my tenure at USC, some the best actors in the school gathered in the largest theatre on campus and produced, to a full house, the entire collection of monologues I and a friend had written over the past four years, each as scornfully and loudly as possible. End this quote and all quotes. I’ve mentioned Jovan twice now, but I wanted to cover this ground sufficiently so you could understand the context of what I’m about to share with you. You can now watch, in its entirety, An Evening with Stallion Cornell, transferred from VHS and now on Vimeo in digital glory. 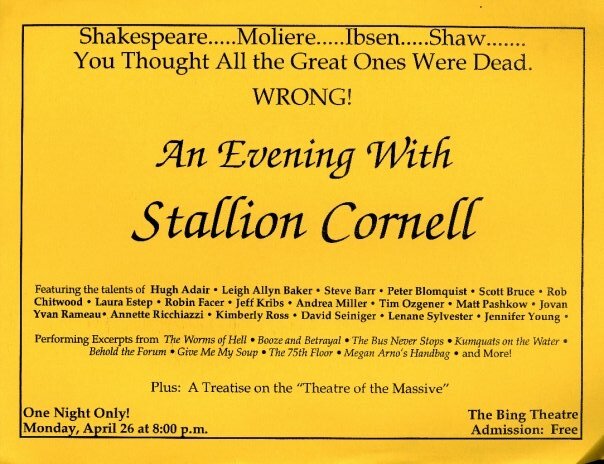 The conceit was that Stallion was one of the great playwrights of the ages, and all of these monologues were excerpts from his famous plays, works like “Booze and Betrayal,” “Rat in a Box,” and “Love and Guts.” Oh, boy, love and guts. I don’t know if you will enjoy it or appreciate it as much as I do. Probably not. It’s utterly ridiculous, for the most part, but it truly represents the highlight of my theatrical life. It;s a thrill to watch so many young, talented people completely committed to hamming up material that is too absurd for words. The goal was for the actors to have more fun than the audience – except the audience ate it up. And how could you not? One of the delights of rediscovering this is Ed Hofmeister’s treatise on a new theatrical art form that the fictional Stallion embodied – the Theatre of the Massive. I really wish this were a real thing. Maybe, after this goes viral, it will be. Or maybe nobody will care. Maybe it’s just a bunch of punks having fun a quarter of a century ago. I can appreciate it on that level, too. I adore all the people in this video, and I miss seeing them every day. I am so grateful to them for this moment we shared, and for their genius and friendship, not necessarily in that order. I’ve reconnected with a few of them, but I’d love to see them all again. Maybe we could get together and do an encore. Regardless, in case you want to skip to the best part, Jovan’s monologue begins at 55:00.